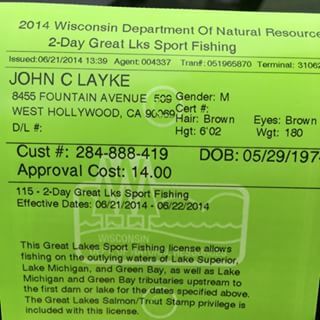 A Wisconsin fishing license costs $20 a year for any resident age 16 or older. There are discounts for first time purchasers, kids age 16 and 17, active members of the armed forces, and senior citizens. Personally, I have no problem paying $20 a year to fish as much as I want. The money goes to support the WI DNR in their efforts to manage and improve our fisheries. Included in this management is fish stocking, which is very important as many lakes have no natural reproduction of some types of fish. It also gives each licensee a stake in the success and beauty of our natural resources. We care more about something when we have to pay for it. Oracle has really been getting on my nerves with their licensing lately. Two times already this year I’ve been harassed in an effort to get us to give them more money. The first time was a periodic license review with the threat of a full audit behind it. Before I even explained our specific situation the salesman was already trying to push me into buying Enterprise licenses that would have costed extra tens of thousands of dollars. We are a small shop and have a very limited number of Oracle database users, and Enterprise Edition is not needed. This second time was a response to a change Oracle has made to their standard edition licensing model. Why was this change made? As far as I can tell, Oracle executives were sitting around trying to think of ways to squeeze more money out of their customers. Here is an announcement of the change from an official Oracle blog. Basically, they have decided to retire license types standard and standard edition one (SE1) at the end of the year. Any licenses purchased after then will have to be SE2 licenses, which will cost more than the SE1 and require us to upgrade the database from our version to the latest version, 12C. There are also additional limitations to the licenses which are designed to push customers to the more expensive editions. For example, the new hardware limit on CPUs is 2 physical sockets with no more than 16 threads. Having researched these new limitations before my call with them, I was interiorly bristling as they probed me with questions about our current environment. “I just want to understand your environment” the Oracle guy told me. I can just picture how that conversation goes for those that are unaware. “Oh, you’re database server has four sockets? You’re going to need to upgrade to Enterprise Edition or risk being out of compliance.” The Oracle guy also implied that they are trying to get into hardware sales as well. When you’re trying to nickel and dime me to death for the use of your software, why would I want to get my hardware from you too? These license concerns are a real shame because the software itself is very good. Having learned to be a DBA on SQL Server, I still prefer Microsoft’s RDBMS, but I can definitely appreciate all Oracle’s RDBMS has to offer. I’m not sure if it’s worth the headache involved in dealing with Oracle’s greed and desire to rule the world.